Ted Hopkins' name is etched in the games pantheon of Grand Finals heroes. Then a bench-warming small forward for Carlton, Hopkins is forever remembered as the man who burst on to the MCG after half-time of the 1970 Grand Final and helped the Blues reel in the 44-point win over bitter rival Collingwood. In 1995, Hopkins founded Champion Data, an independent sports statistics and analysis company. It has since become the official stats provider for the AFL, its clubs and most media outlets. Hopkins introduced a new language to the game with 'hard ball gets', 'inside-50' and 'clangers' now part of the AFL lexicon. 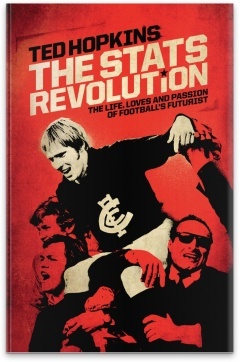 In The Stats Revolution is Hopkins personal story of the world of AFL football, a unique tale written by a unique man. Referred to as Football’s Futurist, Ted Hopkin’s is well-know in the football world. A VFL Premiership player, he is most famous for his 4 goal effort in Carlton’s 1970 Grand Final win. Hopkins played twenty nine games for the club, including the 1969 & 70 Grand Finals, for the then VFL club, retiring in 1971. In 1995 he founded Champion Data as an independent sports statistics and analysis company. The Company has since become the official statistics provider for the AFL and is the leader in producing sports statistics, analysis and stories for all the major media outlets and AFL clubs. Hopkins is the stats guru of the AFL.